Predetermined fires organize the battlefield for the gunners. They allow the leader and gunner to select potential targets or target areas that will most likely be engaged or that have tactical significance. This includes dismounted enemy avenues of approach, likely positions for automatic weapons, and probable enemy assault positions. The gunners do this by using sectors of fire, final protective lines, or a principal direction of fire and selected target areas. This preparation maximizes the effectiveness of the machine gun during good as well as limited visibility. It enhances fire control by reducing the time required to identify targets, determine range, and manipulate the weapon onto the target. Abbreviated fire commands and previously recorded data enable the gunner to aim or adjust fire on the target quickly and accurately. Selected targets should be fired on in daylight whenever practical to confirm data. The range card identifies the targets and provides a record of firing data. Several terms are associated with predetermined fire that every gunner needs to know. a. Sector of Fire. A sector of fire is an area to be covered by fire that is assigned to an individual, a weapon, or a unit. Gunners are normally assigned a primary and a secondary sector of fire. b. Final Protective Fire. An FPF is an immediately available prearranged barrier of fire to stop enemy movement across defensive lines or areas. c. Final Protective Line. An FPL is a predetermined line along which grazing fire is placed to stop an enemy assault. If an FPL is assigned, the machine gun is sighted along it except when other targets are being engaged. An FPL becomes the machine gun's part of the unit's final protective fires. An FPL is fixed in direction and elevation; however, a small shift for search must be employed to prevent the enemy from crawling under the FPL and to compensate for irregularities in the terrain or the sinking of the tripod legs into soft soil during firing. Fire must be delivered during all conditions of visibility. d. Principal Direction of Fire. A PDF is a direction of fire assigned priority to cover an area that has good fields of fire or has a likely dismounted avenue of approach. It also provides mutual support to an adjacent unit. Machine guns are sighted using the PDF if an FPL has not been assigned. If a PDF is assigned and other targets are not being engaged, machine guns remain on the PDF. A PDF has the following characteristics. (1) It is used only if an FPL is not assigned; it then becomes the machine gun's part of the unit's final protective fires. (2) When the target has width, direction is determined by aiming on one edge of the target area and noting the amount of traverse necessary to cover the entire target. (3) The gunner is responsible for the entire wedge-shaped area from the muzzle of the weapon to the target, but elevation may be fixed for a priority portion of the target. (downward) by lowering the muzzle of the weapon. To do this, the gunner separates his elbows. f. Dead Space. The extent of grazing fire and the extent of dead space may be determined in two ways. In the preferred method, the machine gun is adjusted for elevation and direction. A member of the squad then walks along the FPL while the gunner aims through the sights. In places where the soldier's waist (midsection) falls below the gunner's point of aim, dead space exists. Arm-and-hand signals must be used to control the soldier who is walking and to obtain an accurate account of the dead space and its location. Another method is to observe the flight of tracer ammunition from a position behind and to the flank of the weapon. g. Fire Control. Predetermined targets, including the FPL or PDF, are engaged on order or by SOP. The signal for calling for these fires is normally stated in the defense order. Control these predetermined targets by using arm-and-hand signals, voice commands, or pyrotechnic devices. Gunners fire the FPL or PDF at the sustained rate of fire unless the situation calls for a higher rate. When engaging other predetermined targets, the sustained rate of fire is also used unless a different rate is ordered. h. Primary Sector of Fire. The primary sector of fire is the area to be covered by an individual or unit. i. Secondary Sector of Fire. The secondary sector of fire is the same area covered by the same individual or unit after it has moved to a different location. 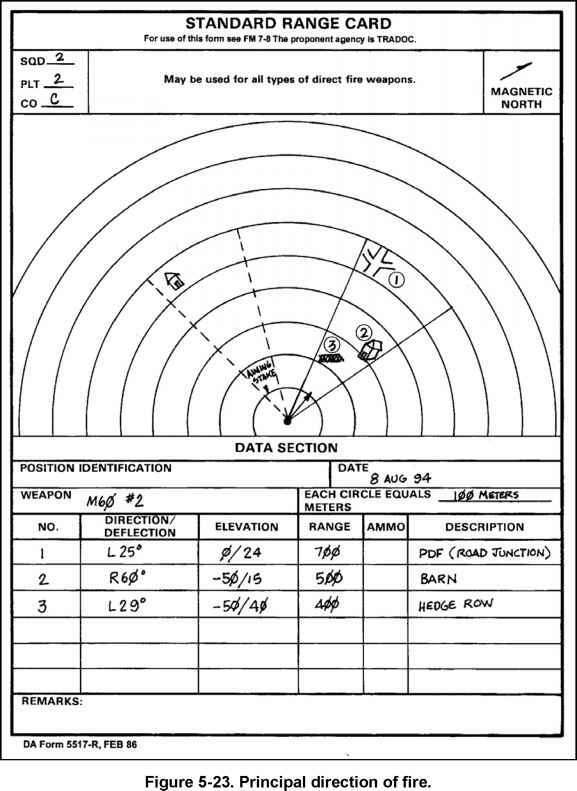 • Range, azimuth, and number label to predetermined targets. • Distance and azimuth from a known point or eight-digit grid coordinate (reference point). Figure 5-21. M249/M60 and M240B machine gun symbol. a. Procedures. The machine gun is placed in the tripod-supported mode in the position it will be fired. The machine gun symbol is sketched on the range card pointing toward the most dangerous target in the sector. (1) If using the FPL, the gunner aims the machine gun along the FPL. This procedure will also be either the left or right limit of the sector of fire. To set the limit, he slides the T&E mechanism all the way to the left or right end of the traversing bar. Then, he moves the tripod until the barrel lines up on the FPL. The sector of fire with the FPL along one limit is now prepared. The FPL is always labeled target number 1. 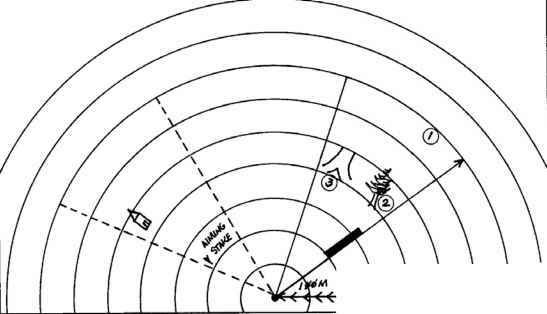 (2) To determine the range for all targets in the sector, the gunner ensures each circle, except the first one, represents 100 meters. Since the lowest setting on the M249 and M60 is 300 meters and the M240B is 200 meters, the first circle represents 200 or 300 meters. He indicates this on the range card in the data section just below the circles. On the top half of the range card, the gunner draws the left or right limits from the weapon position to the maximum effective range of the machine gun. (3) If the FPL is assigned, the machine gun symbol is drawn along that line (left or right limit) (Figure 5-22). The extent of grazing fire is determined. A shaded blade is sketched on the inside of the FPL to represent the extent of the grazing fire. If there is dead space along the FPL, it is shown by breaks in the shaded area. The ranges to the near and far edges of the dead space are recorded above the FPL, and the extent of the grazing fire is recorded along the FPL. The magnetic azimuth of the FPL is determined and recorded below the shaded blade representing the FPL. The elevation reading and other data are recorded in the data section. (4) If an FPL is not assigned, the gunner locks the T&E mechanism on 0 on the traversing bar scale and shifts the tripod until the muzzle points to the PDF. The machine gun symbol is sketched in the center of the left and right limits pointing in the direction of the PDF (Figure 5-23, page 5-20). (5) The opposite primary sector limit is drawn. If a target is along this line, the target information is added to the data section. If the opposite side of the traversing bar cannot be used to mark the opposite side of the primary sector, a direction reading must be recorded in the sketch section. (6) Next, the left and right limits of the secondary sector are drawn using a broken line. The area between the primary and secondary sector is labeled dead space. (7) An arrow is drawn in the magnetic north block (upper right hand corner) pointing in the direction of magnetic north. For use of thl« form sea FM 7-8 The proponent agency Is TRADOC. Figure 5-22. Final protective line. (8) The position is oriented with a prominent terrain feature (recognizable on a map) by obtaining a magnetic azimuth to or from the terrain feature to the position. A line is drawn between these two points. Arrow barbs are drawn along this line pointing in the direction the magnetic azimuth was taken. The magnetic azimuth is recorded in mils or degrees below the line. If a prominent terrain feature is not available, identify the position by using an eight-digit grid coordinate. The grid coordinate is recorded below the position on the range card. (9) The gunner's number, unit designation (SQD, PLT, CO), and date are recorded in the upper left-hand corner. For security, do not use a unit designation higher than a company. (10) Targets within the sector are identified. A symbol is drawn to represent the target in the appropriate place within the sector of fire. Targets in the primary sector are shown by numbers and enclosed in circles. An FPL, when assigned, is always labeled target Number 1. Other targets are assigned subsequent numbers in order of tactical importance. (a) Wide targets in the primary sector are usually engaged in the center; however, the initial burst can be positioned anywhere the leader designates. The gunner measures the target width and records it in the data section; for example, TW-20 (target width is 20 mils). The gunner lays on the point on the target where the initial burst will be placed, and traverses to one edge of the target, while counting the clicks. He records the number of clicks he traverses and the direction he moves the muzzle; for example, TW-20/R7 (target width, 20 mils; right 7 clicks). After the initial burst, the gunner traverses 7 clicks to the right edge of the target and back to the left 20 clicks to cover the target area. To lay on the left edge of the target, the gunner records TW-20/R20. (b) When field expedients are used with the machine gun to engage targets, they are sketched above the drawing of the target. Predetermined targets in the secondary sector are sketched on the range card and ranges to these targets are recorded below the targets but not in the data section. Field expedients should be used for targets in the secondary sector. b. Field Expedients. When laying the machine gun for predetermined targets, the gunner can use field expedients as a means of engaging targets when other sources are not available. These methods are not as effective as the traversing bar and T&E mechanism method. 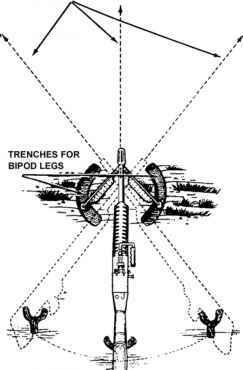 (a) Defines the sector limits by laying the gun for direction along one sector limit and by emplacing a stake along the outer edge of the folded bipod legs. Rotates the legs slightly on the receiver, so that the gunner takes up the "play". Uses the same procedure for placing a stake along the opposite sector limit. (b) Lays the machine gun along the FPL by moving the muzzle of the machine gun to a sector limit. Adjusts for elevation by driving a stake into the ground, so that the top of the stake is under the gas cylinder extension, allowing a few mils of depression to cover irregularities in the terrain. 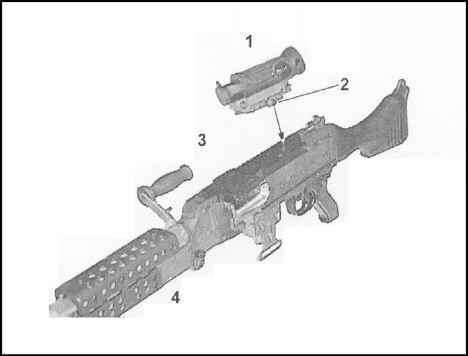 (c) Lays the machine gun to engage other targets within a sector limit, in a primary sector by using the procedure described previously, except keeps the elevation fixed. Figure 5-24. Notched-stake or tree-crotch technique. (a) Drives either a notched stake or tree crotch into the ground where selected targets are anticipated. Places the stock of the machine gun in the nest of the stake or crotch and adjusts the weapon to hit the selected targets and to define his sector limits. NOTE: If notched stakes and crotches are not available, tent poles can be used. It requires four poles for the left and right limits and additional poles for target areas. The gunner drives two poles in the ground in the shape of an X and then places the stock within that X as described with stakes and crotches. What is the sector sketch symbol for a 240?